Rufus Gibson knows how to entice your freaky self. Born and raised in Buffalo, also known as Steve Gibson, he has been continuously maintaining a foundation for his city’s house and techno scene while also touching base beyond with his performance and productions. An integral asset to the city of Buffalo, Gibson has played an important role developing a strong home base in his city. He has spent the last few years continuing the growth of Igloo Music, a collective that was originally founded by Paul Kuenzi and Brandon Chase. Most recently he has been working alongside Zach Brown and Alex Morrison to develop Redux; in it’s beginning stages, the group is striving to bring the Buffalo house and techno family together with an emphasis on intimacy. Additionally, Gibson has been hard at work in the studio putting out productions that have been acclaimed by the likes of Phil Weeks, Hector Moralez, Demuir, Around7, Arturo Garces, and Jason Hodges. This year he put out compilations for two crews out of Boston, Mass. 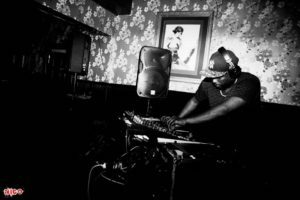 Under Basement Movement he released “Gruv It To The Flo'” and by way of Lifted Contingency a soulful house tune called “Jus’ Love A Lil Bit.” Just last year Gibson also collaborated forces with Nickie Fowler and put out a groovy and heady track titled “Busted” through Chicago’s Fresca Recordings. He pulls inspiration not only from raw and rooted house and techno, but also from artists like Outkast, George Clinton, Q-Tip, Pete Rock, DJ Premier, “and of course Rick James,” he says. After a recent signing with Gourmand Music Recordings, a label by French artist JR From Dallas, Gibson will have an EP release in June titled “Funky Man’s Back.” So stay tuned. If you want to catch a set and not near upstate New York, keep your eyes peeled. He’ll be holding down events in the coming summer months in Boston, Denver and more.